I am developing an app where the user can draw lines (drawings). The lines get then converted to sprites with CCRenderTexture. The problem is that after the update 1.5.0.0 the lines aren't converted anymore (or not visible). I read the new render pipeline, especially the part about visiting in a render texture but I could not find out the problem in my code. I have attached a screenshot with before and after the update. Anyone an idea what could be going wrong in my code? Although to be honest, without knowing where you're get bounding and FrameSize, the transformation does seem a little strange. When the CCDrawNode is used via a Visit it is offset from the bottom left corner of the screen. At this time we do not support passing in a custom viewport for the render texture so you will need to offset the position by the amount from the bottom left. So that's why the transformation (proposed by @kjpou1 ). 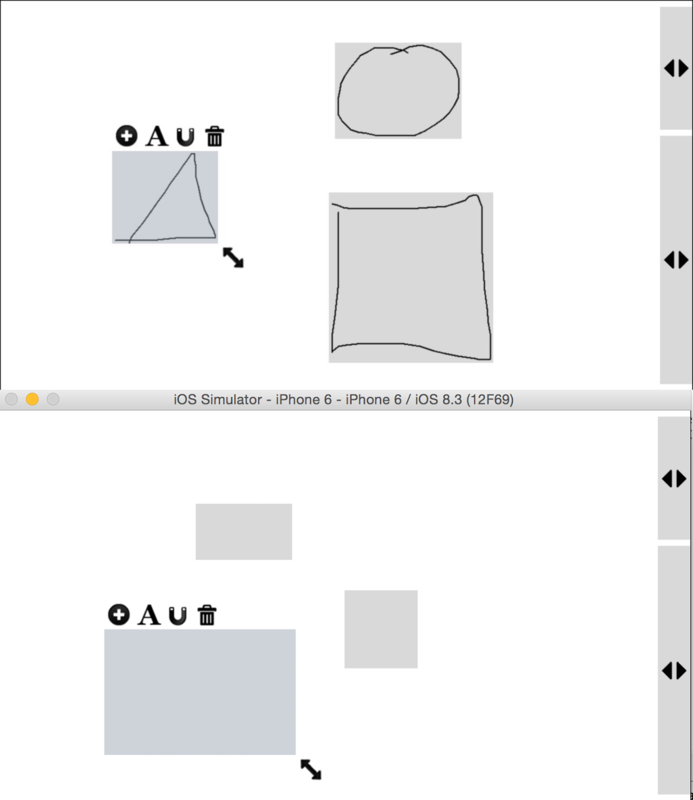 Bounding is just the boundingRect of the drawnode and framesize is just 10.0. Now all I want to do is to save the drawnode into a texture and I tried both your examples (with and without transformation) but still get an empty sprite without the drawing inside and just the background. Those above create an image from connected lines drawn on the background image. Thank you for the links. As I said it worked perfectly before the update. As soon as I installed the update it broke. I tried every possibility in your links but still the same problem. I have done a minimal application that does exactly the thing I want and the problem is also there. Could you please have a quick look at it? Thanks for the code. Instead of posting back your project I will try to explain what is going on from your example. That way if anyone wants to take a look at your project and then the mods to get it to work the way you want. // this will then be passed to the Visit(ref CCAffineTransform) method. In the section of code above you are drawing to a canvasNode DrawNode that is basically the size of the screen. You then want to take only that part of the image that was drawn and create a smaller image version containing only that part of the image that was drawn to the DrawNode. We added in the last release a convenience property BoundingRect to allow you to get this bounding region. Hmm, maybe BoundingRegion would have been a better name instead of BoundingRect. Well that is neither here nor there and anyway this allows you to obtain that region. You then need to create a render target the size of this bounding area which BoundingRect does for you with BoundingRect.Size. This is then used to create the render target. Because the canvas DrawNode obtains the screen points they can be anything from 0,0 to the screens width and height. You only need that section of the canvas that has been drawn to so that is obtained from the BoundingRect.Origin which is the lower left corner of all the primitives that were drawn to the canvas. We will create a translation transform that will offset our drawing when we do the canvasNode.Visit() so that we will only draw that section of the node to our render target. In your GameLayer in OnTouchesEnded you are clearing the lines before the rendering has had a chance to render to the render target. Basically direct drop from Render Target example. line.Clear ();  <---  Moved here for now. //line.Clear ();  <----- Can not do this here because you have not given the renderer the time render the lines yet. The Renderer Pipeline is not an immediate render process anymore as outlined in the Renderer Pipeline overview that Rami posted. Basically it takes all these draw calls and batches them up to be processed at the end of rendering cycle. So what you were doing here is clearing the lines that you had already drawn to the line DrawNode before there was a chance to process them. Thus the reason the line.Clear() being moved to the OnTouchesBegan. You may need to move this someplace else in your overall application. Many thanks for your help and detailed explanation again! I see now that because of my early line.Clear() call I never saw anything not even the "wrong thing"
Is there a possibility to wait for the rendering cycle to end and then call the line.Clear() method? Is this maybe in a separate thread and possible to wait for this thread to end? Do not use both here but instead pick which one you want. CCColor4B takes values from [0 .. 255] inclusive. What you have there is what would be used for a CCColor4F which takes float values [0 .. 1] inclusive. You may be having a problem with your BlendFunc as reported here https://github.com/mono/CocosSharp/issues/252. There is a test here for this as well as explanation in the code. Yes it was the BlendFunc. That solved the problem many thanks! !